Plus - when I get to the top books, you'll find some hints about what people are adding to their "most wished for" books this Christmas. Tell me which was the new art book you enjoyed the most in 2011. Leave a comment on this post and I'll share the results with you either later this month or in next month's update. Just to let you know that I've also published a new lens about oil painting books. The Best Books about Oil Painting was created as a result of the feedback you gave me about the oil painting books you rated. So this new site collates all the collective wisdom for all to share. Amazon.com is continuing to mess about with its own categories and rankings which is having an adverse impact on searches for art books for adults. It would be really nice if I could say that their actions were improving the existing mess - but I really do think that it's actually getting worse. They seem to be downsizing the number of categories and reducing the level of specialisation. I'm really not sure how that benefits the customer as well as Amazon. For example, the Amazon listings for art books are even more "screwed" up than usual this month. I've checked with the Wayback Machine and this what seems to have happened. The normal mess in the ranking lists has now been complicated by the addition of an awful lot of books about rock musicians. I don't ever remember seeing these in previous months. Then I discovered that the Arts & Photography category has now been deemed to be the most appropriate home for 'Music' which does not appear to enjoy a top level category all to itself. Presumably in an effort to reduce the number of books categorised as "Non fiction". This is a big mistake and is going to make finding decent art books even more difficult. What's wrong with creating a dedicated Music category within Books at the top level is beyond me. Plus consistently top rated art books for adults have also dropped like a stone from the charts - to be replaced by art books for kids! This is particularly puzzling since Children's Books used to have a category for "Arts and Music" and that has now been removed from the sub-category list! It looks rather as if all the Kids Art Books have been transferred from "Childrens" to "Arts" - but they have no dedicated sub-category in the Arts category. Unless you look them up under "Best Sellers" in Children's Books when an arts, crafts and music category reappears! Duh! Tortuous. Like I said - it's now worse than before. Systemic shenanigans of this nature certainly makes updating my listings of top art books very much more difficult. I have my fingers crossed that they'll decide pretty soon that the changes are negative and not positive and make some more! I've had to do an awful lot of triangulation and cross-referencing and interpretation to end up with my top ten art books for November. Fortunately Amazon.co.uk is still relatively intact and is less messed up due to the fact that it very sensibly has a Music, Stage & Screen category. Overall there's not been a lot of change - after I've discounted books for kids etc! Drawing: I'm somewhat perplexed by the Drawing section which is now dominated by books for children. The changes described above have had a big impact here with The New Drawing on the Right Side of the Brain no longer the best selling book it has been for ages - you don't find it until #12. Which given its pedigree and sales history is a complete nonsense. Except possibly people have switched to ordering the new edition which is due to be published in 2012? Anyway, given that the Amazon changes sometimes change back in the following month, I've switched Betty to "Top rated" and highlighted the second Andrew Loomis book - Drawing the Head and Hands - as the best seller. Painting: Color and Light by James Gurney celebrates one year at or very near the top of the painting book charts at Amazon. It has been the #1 top rated book about painting for most of that year. The most impressive book in November is The Louvre: All the Paintings which is amazing - all the paintings on display in the Louvre in one book. The Louvre: All the Paintings has become an official "mover and shaker" and is #7 in the list of "most wished for" books. Van Gogh: The Life is also very much on the "most wished for" books. 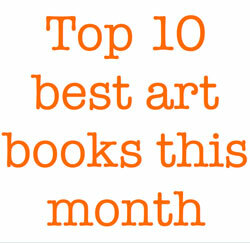 The Art Museum is just outside the top 20 of the most wished for books. It's very impressive and definitely worth a look at the very least, however this book is both MASSIVE and HEAVY. You may need to invest in new furniture on which to lay this book at an angle in order to read this book. I know - I tried to read it in Waterstones and ended up having to prop it up at 45 degrees. I should also add it's on my Christmas wish list and will be bought via Amazon given the price! Of course, I'm a Californian, but I really have been enjoying a book written and edited by Jean Stern and Molly Siple called "California Light - A Century of Landscapes" Paintings of the California Art Club. The photos are amazing... and as I said, I'm partial to California landscapes. Painters Eleven-The Wild Ones of Canadian Art by Iris Nowell.My exposure to Canadian Art had largely been that of The Group of Seven until I attended a series of lectures by Iris Nowell on her book. Her style of writing is informal, and provides numerous personal insights on the artists. The book is full of beautifully reproduced artworks. A well researched and entertaining read. Thanks Marian - The book about the California made it on to one of my lists when it was published. I really wanted to see it but knew it's the type of book which never makes it to UK shores unless ordered. Good to hear that it was good inside as it sounded at the time. Najma - many thanks for alerting me to this book - I'd never heard of it and I guess there will be more like me. Sounds absolutely fascinating.